According to the Proposal, this activity was initiated in June 2014 (Workshop on HE-Industry relationship held at the Chamber of Commerce and Industry of Serbia, October 2014). At the PMB meeting held on December 4th, 2014, it was decided to launch a questionnaire addressed to all the members of the Chamber of Commerce of Serbia (more than 1000 addresses). 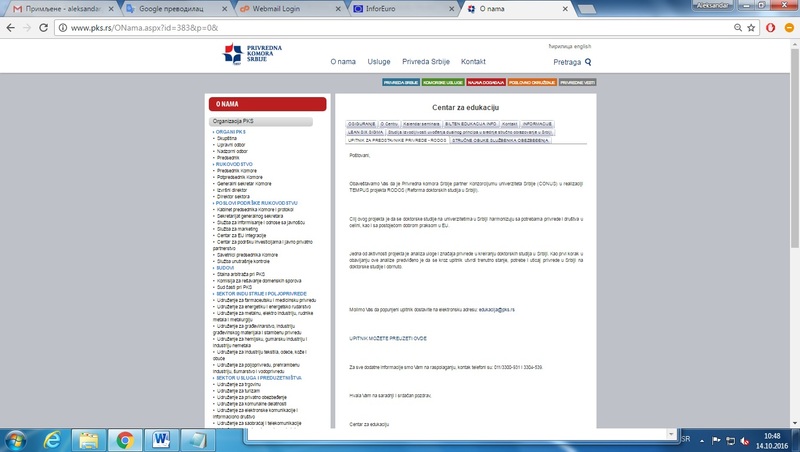 The on-line form of the questionnaire was implemented at the Site of the Chamber of Commerce. The questionnaire contained the following main items: 1) Current situation in the enterprise; 2) Desirable qualifications of PhD bearers; 3) Collaboration with HE and research institutions; 4) Opinion about doctoral studies in Serbia; 5) Trends of the economic development of Serbia and potential role of doctoral studies. The responses were assembled and analyzed by a Working Group nominated by the PMB. The results were presented and discussed at the Conference held in the Chamber of Commerce on April 23rd, 2015. Having in mind the importance of the subject, it was decided to organize a series of additional similar conferences in other towns of Serbia. In Novi Sad, on the May 7th, 2015, the previous activities and documents were analyzed and plans for future activities were adopted. It was decided to intensify contacts with industry by focusing on large companies, like NIS (Oil Industry of Serbia) or Telekom Serbia. Additional discussions were organized until the end of the Project: in Kragujevac (organized with the Regional Chamber of Commerce Kragujevac) June 16th, 2015, in Niš (Regional Chamber of Commerce Niš), September 23rd, 2015, in Novi Pazar (Regional Chamber of Commerce Kraljevo, Office in Novi Pazar) October 22nd, 2015. The final results of the surveys, in which both industrial organizations and doctoral students took part, are given at the Project Site. They were used as a basis for defining the Roadmap (Activity 2.4).